Use the orange numbers to navigate you through the guide for detailed explanations. Our contact details are printed at the top of every page. Note that these may vary depending on your location, contract arrangements etc. This is the unique reference number for this invoice. Please quote this in any correspondence with us. Your invoice number comprises of 12 random digits, NB: Each subsequent invoice number is numerically greater than the previous. This section explains the period of time to which the charges refer and the date of issue of the invoice. You will need to use these fields should you wish to track sequential invoices. This shows any reference number you may have provided to us to help you identify this account internally. This single letter is your Rota Disconnection Code. Rota Disconnection is used in the case of severe shortages of energy and has to be authorised by the Secretary of State for Energy. The code is allocated on a postcode basis by your Distribution Network Operator (DNO) and determines the block you are assigned to should any planned disconnections be necessary (blocks would be turned off in rota). The code also identifies specific vital service supplies such as hospitals which are protected from disconnection. This is where we send your invoice. Specifies the date by which you have to pay the amount due from the date of the invoice. These are your agreed payment terms. If payment is by cheque or BACS please allow enough time to ensure payment is cleared by the due date. The address that the charges in this invoice apply to. 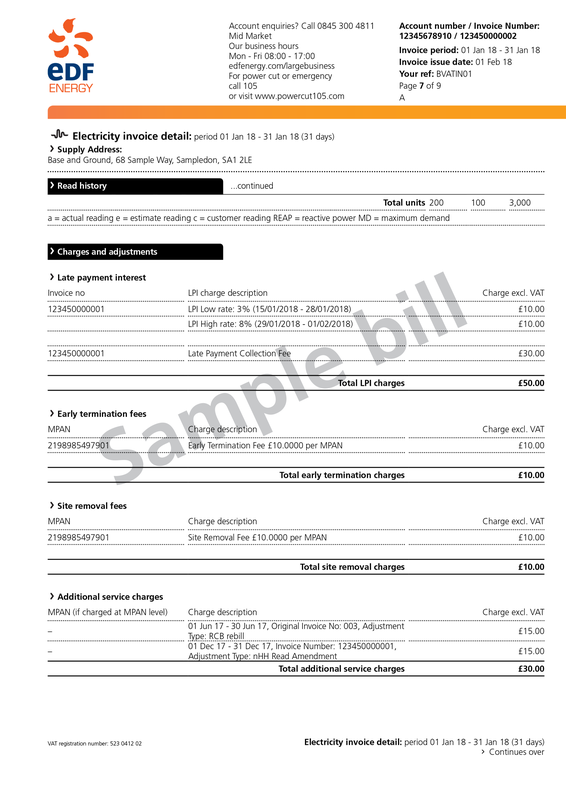 Summarises all the individual charges within your bill and provides a total amount to be paid. The amount of charges outstanding from your previous bill which have been brought forward. 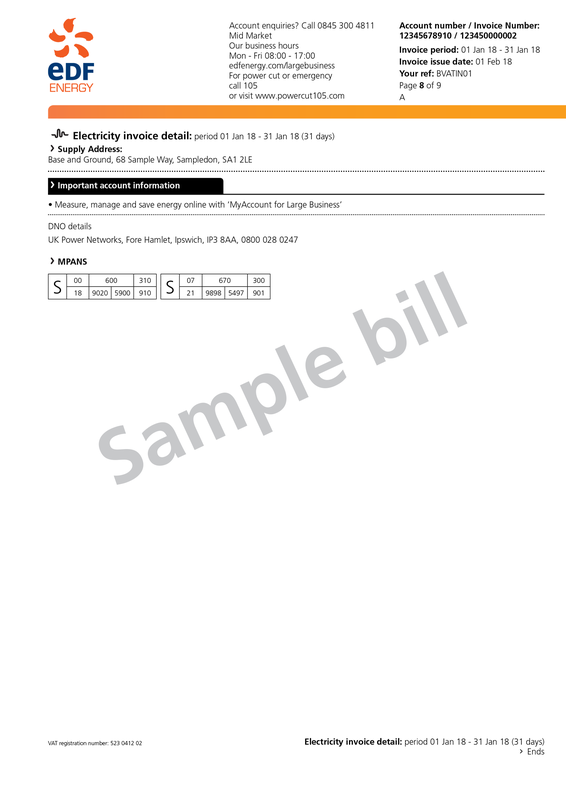 The section includes important information about your bill and other services we can offer which may help your business. 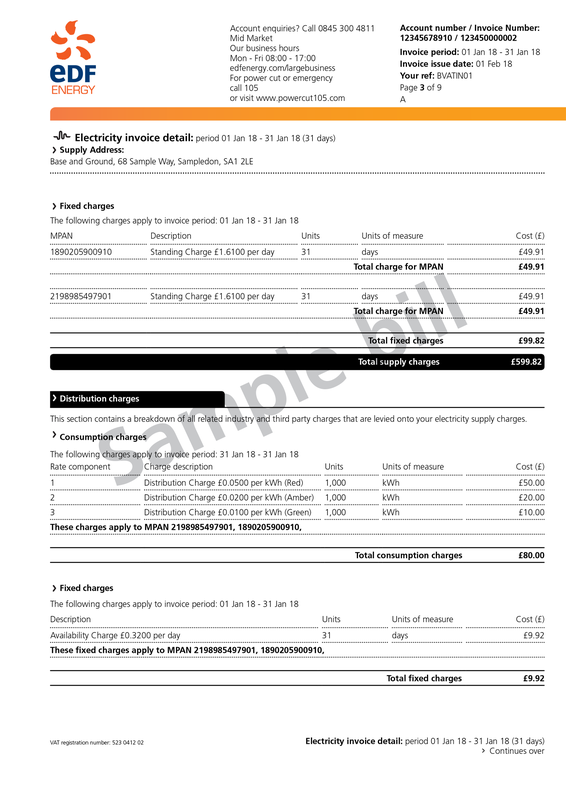 Energy charges are broken down into fixed charges and consumption charges and can easily be tied back to the information in the detail section - see next pages. 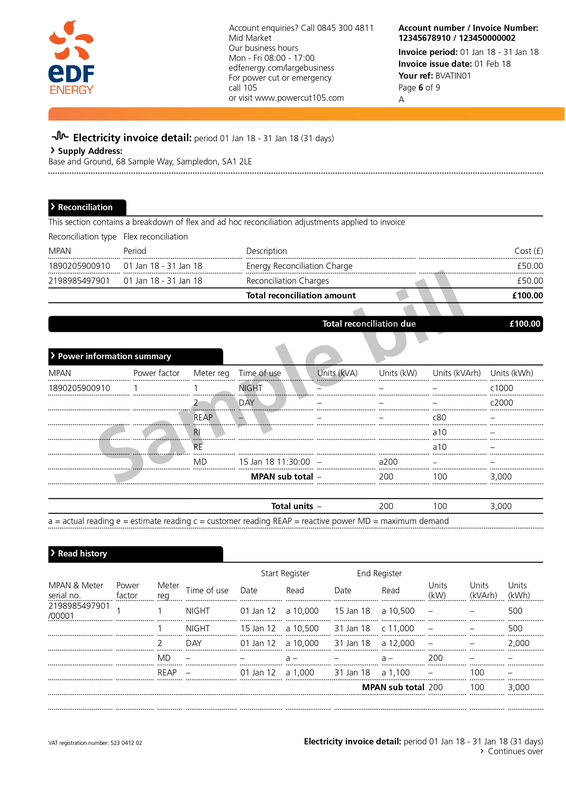 Each line item total charge is broken down fully within the relevant section of the bill detail pages. 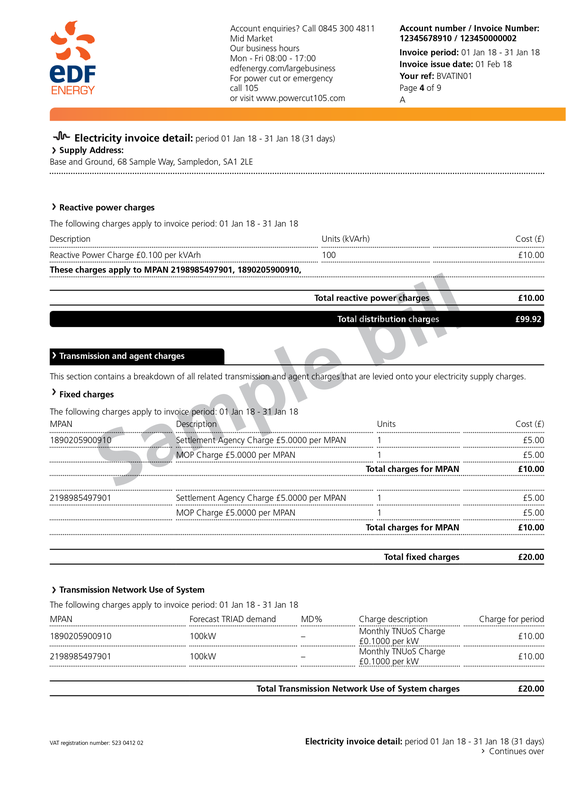 Information on any additional charges you may have incurred can be found in the ‘Additional Service Charges’ section under ‘Charges and Adjustments’ reference point 29. CCL is a tax designed to encourage greater energy efficiency within businesses. CCL is charged per unit of energy used and is listed as a separate element on your bill. These are the rates of VAT applicable to the supplies of electricity. VAT will usually be applied at the standard rate. Whereas supplies that are wholly or partly for domestic or charitable nonbusiness use may qualify for the reduced rate of VAT. This section summarises key information about the type of contract you have with us. This includes the earliest date that you can terminate the contract with us as well as the type of product you are on. This is the reference unique to the contract you have with us. This is the earliest date you can terminate your contract with us. The pricing point indicates whether the contract is fully inclusive (customer terminal) or you have opted for some charges to be passed through. This indicates whether you are on a fixed, flexible or export contract. The proportions of generation sources that make up your electricity supply. Shows the level of exemption you have if you have one. This shows how the transmission charges are calculated. This section summarises technical information about the meter(s) associated with this account. These charges show how much electricity you’ve used for the billing period. These are broken down according to your tariff, with each rate described on the left, and the totals listed separately in the right-hand column. Fixed charges are listed individually and cover the costs associated with providing electricity to the site(s) on this account e.g. providing cables and reading meters. These costs are charged regardless of how much electricity is used. The charges incurred for the use of the local Network Operator distribution system including, where applicable, availability charges and reactive power charges. Reactive Power charges are passed through from your network operator for each supply point. They relate to power which has not been efficiently converted (wasted power) when operating certain types of equipment. 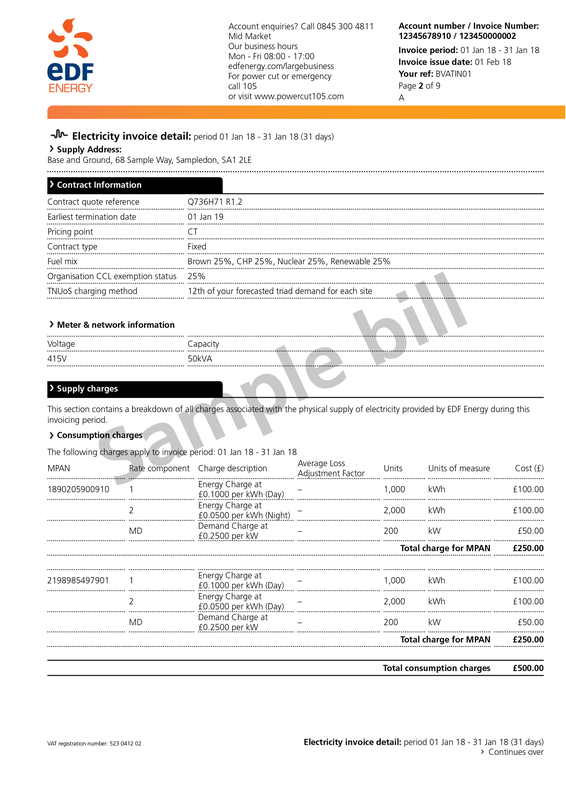 This section details external transmission and agency charges that EDF Energy needs to levy onto your electricity supply charges. Use of Systems Transmission charges are based on forecasts. The charges therefore are subject to change through the year. Therefore an annual reconciliation may be included (as depicted on the next page under the Transmission Network Use of System reconciliation section). This section shows the reconciliation between what you have been charged based on forecasts, against actual charges once these become known. These are charges you have incurred as a result of exceeding any volume tolerance levels which you have agreed in your terms and conditions. This section outlines the reconciliation charges for customers who have a flexible rather than fixed rate contract with us. 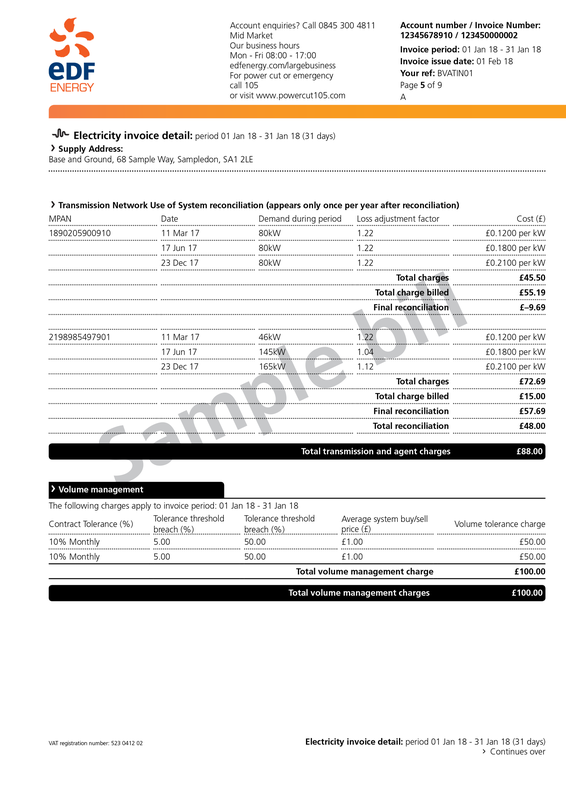 This section gives a detailed breakdown of the usage within the billing period at all Half Hourly meters associated with this account. This section gives you a detailed breakdown of the read history within the billing period for every Non-Half Hourly meter associated with your account. It identifies where the meter readings were estimated, provided by you or actually read by the industry. 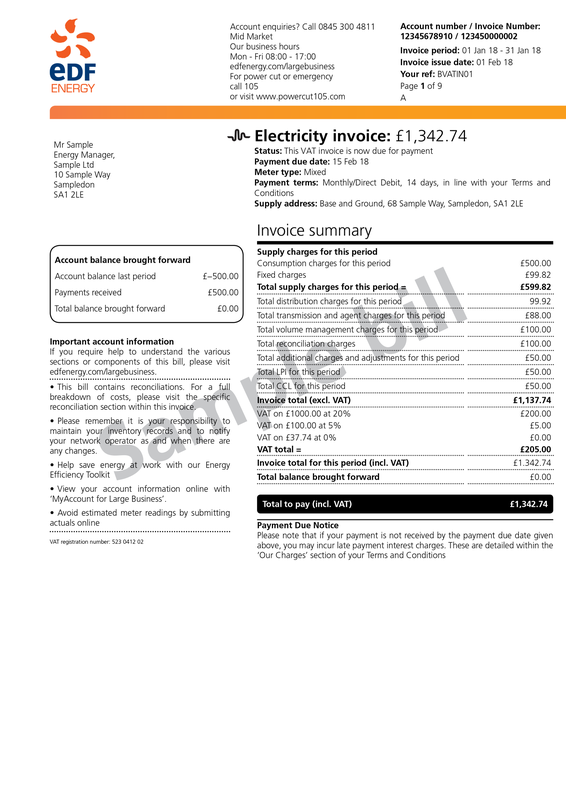 This section details any additional charges or adjustments that may apply to this invoice. This will include charges for any additional services you have arranged with us and any adjustments to your account that have been necessary. These are unique numbers relating to each meter on your site.